Until his accession to the throne of France, he held the title of Count of Provence as brother of King Louis XVI. On 21 September 1792, the National Convention abolished the monarchy and deposed Louis XVI, who was later executed by guillotine. When his young nephew Louis XVII died in prison in June 1795, the Count of Provence succeeded as (titular) king Louis XVIII. 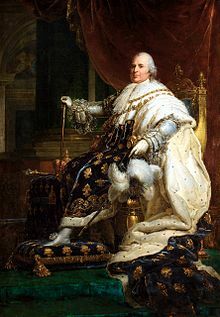 Louis XVIII ruled as king for slightly less than a decade. The government of the Bourbon Restoration was a constitutional monarchy, unlike the Ancien Régime, which was absolutist. 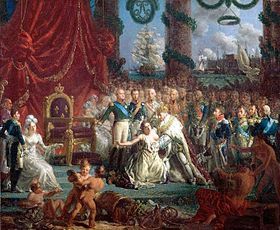 As a constitutional monarch, Louis XVIII's royal prerogative was reduced substantially by the Charter of 1814, France's new constitution. Louis had no children, so upon his death the crown passed to his brother, Charles X. Louis XVIII was the last French monarch to die while still reigning, as Charles X (1824–1830) abdicated and both Louis Philippe I (1830–1848) and Napoleon III (1852–1870) were deposed. Louis Stanislas Xavier, styled Count of Provence from birth, was born on 17 November 1755 in the Palace of Versailles, a younger son of Louis, Dauphin of France, and his wife Maria Josepha of Saxony. He was the grandson of the reigning King Louis XV. As a son of the Dauphin, he was a Fils de France. He was christened Louis Stanislas Xavier six months after his birth, in accordance with Bourbon family tradition, being nameless before his baptism. By this act, he also became a Knight of the Order of the Holy Spirit. The name of Louis was bestowed because it was typical of a prince of France; Stanislas was chosen to honour his great-grandfather King Stanisław I of Poland; and Xavier was chosen for Saint Francis Xavier, whom his mother's family held as one of their patron saints. At the time of his birth, Louis Stanislas was fourth in line to the throne of France, behind his father and his two elder brothers: Louis Joseph Xavier, Duke of Burgundy, and Louis Auguste, Duke of Berry. 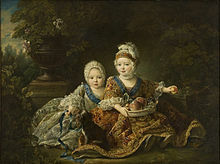 The former died in 1761, leaving Louis Auguste as heir to their father until the Dauphin's own premature death in 1765. The two deaths elevated Louis Stanislas to second in the line of succession, while his brother Louis Auguste acquired the title of Dauphin. In April 1771, when he was 15, Louis Stanislas's education was formally concluded, and his own independent household was established, which astounded contemporaries with its extravagance: in 1773, the number of his servants reached 390. In the same month his household was founded, Louis was granted several titles by his grandfather, Louis XV: Duke of Anjou, Count of Maine, Count of Perche, and Count of Senoches. During this period of his life he was often known by the title Count of Provence. Despite the fact that Louis Stanislas was not infatuated with his wife, he boasted that the two enjoyed vigorous conjugal relations – but such declarations were held in low esteem by courtiers at Versailles. He also proclaimed his wife to be pregnant merely to spite Louis Auguste and his wife Marie Antoinette, who had not yet consummated their marriage. The Dauphin and Louis Stanislas did not enjoy a harmonious relationship and often quarrelled, as did their wives. Louis Stanislas did impregnate his wife in 1774, having conquered his aversion. However, the pregnancy ended in a miscarriage. A second pregnancy in 1781 also miscarried, and the marriage remained childless. Louis Stanislas, Count of Provence, during the reign of Louis XVI of France. 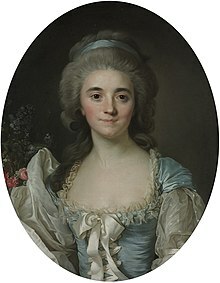 Marie Joséphine, Countess of Provence, Louis Stanislas' wife, by Jean-Baptiste André Gautier-Dagoty [fr], 1775. On 27 April 1774, Louis XV fell ill after contracting smallpox and died a few days later on 10 May, aged 64. Louis Stanislas' elder brother, the Dauphin Louis Auguste, succeeded their grandfather as King Louis XVI. As eldest brother of the King, Louis Stanislas received the title Monsieur. Louis Stanislas longed for political influence. He attempted to gain admittance to the King's council in 1774, but failed. Louis Stanislas was left in a political limbo that he called "a gap of 12 years in my political life". Louis XVI granted Louis Stanislas revenues from the Duchy of Alençon in December 1774. The duchy was given to enhance Louis Stanislas' prestige, however, the appanage generated only 300,000 livres per annum, an amount much lower than it had been at its peak in the fourteenth century. On 5 May 1778, Dr. Lassonne, Marie Antoinette's private physician, confirmed her pregnancy. On 19 December 1778, the Queen gave birth to a daughter, who was named Marie-Thérèse Charlotte de France and given the honorific title Madame Royale. The birth of a girl came as a relief to the Count of Provence, who kept his position as heir to Louis XVI, since Salic Law excluded women from acceding to the throne of France. However, Louis Stanislas did not remain heir to the throne much longer. On 22 October 1781, Marie Antoinette gave birth to the Dauphin Louis Joseph. Louis Stanislas and his brother, the Count of Artois, served as godfathers by proxy for Joseph II, Holy Roman Emperor, the queen's brother. When Marie Antoinette gave birth to her second son, Louis Charles, in March 1785, Louis Stanislas slid further down the line of succession. Brienne's reforms were then submitted to the Parlement of Paris in the hopes that they would be approved. (A parlement was responsible for ratifying the King's edicts; each province had its own parlement, but the Parlement of Paris was the most significant of all.) The Parlement of Paris refused to accept Brienne's proposals and pronounced that any new taxation would have to be approved by an Estates-General (the nominal parliament of France). Louis XVI and Brienne took a hostile stance against this rejection, and Louis XVI had to implement a "bed of justice" (Lit de justice), which automatically registered an edict in the Parlement of Paris, to ratify the desired reforms. On 8 May, two of the leading members of the Parlement of Paris were arrested. There was rioting in Brittany, Provence, Burgundy and Béarn in reaction to their arrest. This unrest was engineered by local magistrates and nobles, who enticed the people to revolt against the Lit de Justice, which was quite unfavourable to the nobles and magistrates. The clergy also joined the provincial cause, and condemned Brienne's tax reforms. Brienne conceded defeat in July and agreed to calling the Estates-General to meet in 1789. He resigned from his post in August and was replaced by the Swiss magnate Jacques Necker. Provence urged the King to act strongly against the declaration, while the King's popular minister Jacques Necker intended to compromise with the new assembly. Louis XVI was characteristically indecisive. On 9 July, the assembly declared itself a National Constituent Assembly that would give France a Constitution. On 11 July, Louis XVI dismissed Necker, which led to widespread rioting across Paris. On 12 July, the sabre charge of the cavalry regiment of Charles-Eugène de Lorraine, prince de Lambesc, on a crowd gathered at the Tuileries gardens, sparked the Storming of the Bastille two days later. On 16 July, the King's brother the Count of Artois left France with his wife and children, along with many other courtiers. Artois and his family took up residence in Turin, the capital city of his father-in-law's Kingdom of Sardinia, with the family of the Princes of Condé. When the Count of Provence arrived in the Low Countries, he proclaimed himself de facto regent of France. He exploited a document that he and Louis XVI had written before the latter's failed escape to Varennes. The document gave him the regency in the event of his brother's death or inability to perform his role as king. He would join the other princes-in-exile at Coblenz soon after his escape. It was there that he, the Count of Artois, and the Condés proclaimed that their objective was to invade France. Louis XVI was greatly annoyed by his brothers' behaviour. Provence sent emissaries to various European courts asking for financial aid, soldiers, and munition. Artois secured a castle for the court in exile in the Electorate of Trier (or "Treves"), where their maternal uncle, Clemens Wenceslaus of Saxony, was the Archbishop-Elector. The activities of the émigrés bore fruit when the rulers of Prussia and the Holy Roman Empire gathered at Dresden. They released the Declaration of Pillnitz in August 1791, which urged Europe to intervene in France if Louis XVI or his family were threatened. Provence's endorsement of the declaration was not well received in France, either by the ordinary citizens or by Louis XVI himself. Louis Charles died in June 1795. His only surviving sibling was his sister Marie-Thérèse, who was not considered a candidate for the throne because of France's traditional adherence to Salic Law. Thus on 16 June, the princes-in-exile declared the Count of Provence "King Louis XVIII". The new king accepted their declaration soon after. Louis XVIII busied himself drafting a manifesto in response to Louis XVII's death. The manifesto, known as the "Declaration of Verona", was Louis XVIII's attempt to introduce the French people to his politics. The Declaration of Verona beckoned France back into the arms of the monarchy, "which for fourteen centuries was the glory of France". Hartwell House, Buckinghamshire, Louis XVIII's court-in-exile from 1808 until the Restoration. Allied troops entered Paris on 31 March 1814. Louis, however, was unable to walk, and so he had sent the Count of Artois to France in January 1814. Louis issued letters patent appointing Artois as Lieutenant-General of the Kingdom in the event of his being restored as king, and on 11 April, five days after the French Senate had invited Louis to resume the throne of France, the Emperor Napoleon I abdicated. The Count of Artois ruled as Lieutenant-General of the Kingdom until his brother's arrival in Paris on 3 May. Upon his return, the King displayed himself to his subjects by creating a procession through the city. He took up residence in the Tuileries Palace the same day. His niece, the Duchess of Angoulême, fainted at the sight of the Tuileries, where she had been imprisoned during the time of the French Revolution. Obverse: (French) LOUIS XVIII, ROI DE FRANCE, in English: "Louis XVIII, King of France" Reverse: (French) PIECE DE 20 FRANCS, 1815, in English: "20 Franc Piece, 1815." Louis XVIII admitted the Count of Artois and his nephews the Dukes of Angoulême and Berry on the Royal Council in May 1814, upon its establishment. The council was informally headed by Prince Talleyrand. Louis XVIII took a large interest in the goings-on of the Congress of Vienna (set up to redraw the map of Europe after Napoleon's demise). Talleyrand represented France at the proceedings. Louis was horrified by Prussia's intention to annex the Kingdom of Saxony, to which he was attached because his mother was born a Saxon princess, and he was also concerned that Prussia would dominate Germany. He also wished the Duchy of Parma to be restored to the Parmesan Bourbons, and not to Empress Marie Louise of France, as was being suggested by the Allies. Louis also protested the Allies' inaction in Naples, where he wanted the Napoleonic usurper Joachim Murat removed in favour of the Neapolitan Bourbons. Louis XVIII succeeded in getting the Neapolitan Bourbons restored immediately. 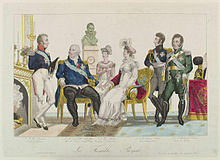 Parma was bestowed upon Empress Marie Louise for life, and the Parmesan Bourbons were given the Duchy of Lucca until the death of Marie Louise. The Battle of Waterloo put a definite end to Napoleon Bonaparte's attempt to return to France and thus secured the Bourbon restoration. By Clément-Auguste Andrieux. 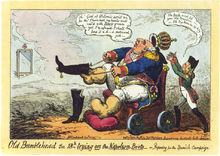 Old Bumblehead the 18th trying on the Napoleon Boots – or, Preparing for the Spanish Campaign, by George Cruikshank, mocked the French Intervention in Spain. The Royal Family. From left to right: Charles, Count of Artois, Louis XVIII, Marie Caroline, Duchesse of Berry, Marie Thérèse, Duchesse of Angoulême, Louis Antoine, Duke of Angoulême and Charles Ferdinand, Duke of Berry. The King's role in politics was voluntarily diminished; he assigned most of his duties to his council. He and his ministry embarked on a series of reforms through the summer of 1815. The Royal Council, an informal group of ministers that advised Louis XVIII, was dissolved and replaced by a tighter knit privy council, the "Ministère de Roi". Artois, Berry and Angoulême were purged from the new "ministère", and Talleyrand was appointed as the first Président du Conseil, i.e. Prime Minister of France. On 14 July, the ministry dissolved the units of the army deemed "rebellious". Hereditary peerage was re-established at Louis' behest by the ministry. Anti-Napoleonic sentiment was high in Southern France, and this was prominently displayed in the White Terror, which saw the purge of all important Napoleonic officials from government and the execution of others. The people of France committed barbarous acts against some of these officials. Guillaume Marie Anne Brune (a Napoleonic marshal) was savagely assassinated, and his remains thrown into the Rhône River. Louis XVIII deplored such illegal acts, but vehemently supported the prosecution of those marshals that helped Napoleon in the Hundred Days. Louis XVIII's government executed Napoleon's Marshal Ney in December 1815 for treason. His confidants Charles François, Marquis de Bonnay, and the Duke de La Chatre advised him to inflict firm punishments on the “traitors”. King Louis disliked the première prince du sang, Louis-Philippe d'Orléans, and took every opportunity to snub him, denying him the title of "Royal Highness", partly out of resentment for the Duke's father's role in voting for Louis XVI's execution. Louis XVIII's nephew, the Duke of Berry, was assassinated at the Paris Opera on 14 February 1820. The Royal Family was grief-stricken and Louis XVIII broke an ancient tradition to attend his nephew's funeral, as previous kings of France could not have any association with death. The death of the Duke of Berry meant that the House of Orléans was more likely to succeed to the throne. 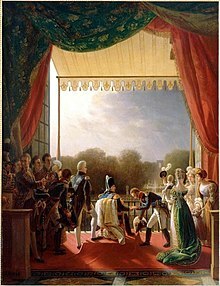 Louis XVIII on a balcony of the Tuileries Palace receiving the Duke of Angoulême after his successful military campaign in Spain. ^ In his official acts as king, Louis XVIII dated the years of his reign from 1795, when his nephew Louis XVII died. This article incorporates text from a publication now in the public domain: Chisholm, Hugh, ed. (1911). "Louis XVIII. of France" . Encyclopædia Britannica. 17 (11th ed.). Cambridge University Press. p. 47. ^ "Louis XVIII (1755–1824) Le "Roi-fauteuil"" (in French). Retrieved 12 August 2013. ^ Louis Victor Flamand-Grétry (1840). Itinéraire historique, géographique, topographique, statistique, pittoresque et bibliographique de la vallée de Montmorency, a partir de la porte Saint-Denis a Pontoise inclusivement: Contenant la description complète de la ville de St.-Denis ... : suivie de la biographie des rois, reines, princes … (in French). Paris: Bertrand. p. 218. ^ Castelot, André, Madame Royale, Librairie Académique Perrin, Paris, 1962, p. 15, ISBN 2-262-00035-2, (French). ^ Le Petit Robert 2, Dictionnaire universel des noms propres, Dictionnaires Le Robert, Paris, 1988, p. 1017. ^ Lever, Evelyne, Louis XVI, Fayard, Paris, 1985, p. 508. ^ a b Fiszerowa, Wirydianna (1998). Dzieje moje własne. Warsaw. ^ texte, France Auteur du (1 July 1814). "Bulletin des lois de la République française". Imprimerie nationale – via gallica.bnf.fr. ^ Jonathan. Fenby, "Return of the King." History Today (Oct 2015, Vol. 65 Issue 10, p49-54. ^ The Chamber of Deputies is comparable to the House of Commons. To have the right to vote for the Chamber of Deputies, one had to be an adult male and pay 300 francs a year in tax. ^ The Chamber of Peers was the upper house of the legislature, and was akin to the UK House of Lords. ^ The biens nationaux were estates and goods, including art works, that the Republic confiscated from the clergé, noblesse and émigrés during the Revolution. Those who lost their estates and/or other valuables would later be compensated in the reign of Louis XVIII's brother, Charles X. ^ Frederick Artz, Reaction & Revolution: 1814-1832 (1934), p 127. ^ John W. Rooney, Jr. and Alan J. Reinerman, "Continuity: French Foreign Policy of The First Restoration" Consortium on Revolutionary Europe 1750-1850: Proceedings (1986), Vol. 16, pp 275-288. ^ Bettina Frederking, "‘Il ne faut pas être le roi de deux peuples’: strategies of national reconciliation in Restoration France." French History 22.4 (2008): 446-468. ^ Artz, France under the Bourbon restoration, 1814-1830 (1931), pp 16-21. ^ Lever, Évelyne, Louis XVIII, Fayard, Paris, 1988, p. 417. Wikimedia Commons has media related to Louis XVIII of France.